I cried straight through, from morning into evening, on that last day in the Tanzanian village I had called home for two years. It was spring of 2000 (well, spring in North America where I was headed, but in equatorial East Africa, it was the end of the year’s heavy monsoon season, transitioning into drier months). Officially, I had been teaching writing at a newly-formed university for the previous two years, but in reality, I was a student studying village life. The lessons I learned ranged from identifying different varieties of mangoes, to memorizing Swahili noun classes, to ceding my American sense of control over things like health, or what time (or even which day) a bus would arrive. My most dedicated teacher was a girl named Modesta—she was probably about 14 when I left. Folks in Tanzania often don’t know their ages. Modesta, like many girls I met there, faced some hard circumstances—not enough money to be guaranteed healthy food or education beyond primary school—and yet, Modesta was anything but pitiable. She infected me, and everyone she knew, with joy. Katie with her friend Modesta in Tanzania. But back to my crying. That last day, the tears started flowing midmorning as I bid Modesta goodbye, and they continued as I unpegged the last of my laundry from the clothesline, visited the medical dispensary for my final allotment of malaria meds, and watched my last sunset from the rocky hills above my house. Half an hour into my overnight train journey to Tanzania’s capital, just when I thought I had shed my last tear, the train passed by Modesta’s paternal grandfather’s remote village of Lawanima. I gazed out the window, remembering the full day’s walk Modesta and I had made to visit her relatives in this village that was only accessible by foot or bicycle. But I didn’t have to rely on my memory of Modesta’s relatives. Somehow even they had received the message that I would be leaving on that evening’s train, and there they were, lined up along the tracks, waving a final goodbye. Katie with Modesta and her relatives in Lawanima. Several months later, I was settled back in the US. I had a good job and felt generally happy, and yet I spent most evenings at home, writing about Tanzania. Writing was my means of mourning and celebrating everything I missed about East Africa: laughing with vendors after a robust bargaining exchange in the market; taking the time to extensively greet each of my neighbors in the morning (What is the news of your family? What is the news of your work?…); listening to Tanzanian friends’ stories infused with tales of witchcraft and magic; and even, balancing sloshing buckets of water on my head. Katie, carrying water to her house. I knew the old dictum—write what you know—but, frankly, after returning to the US, writing about living and working at a small college in Indiana never occurred to me. When I did occasionally venture off campus, I was boxed up in my car, headed for the grocery store, significantly less immersed in local culture than I had been in Tanzania. 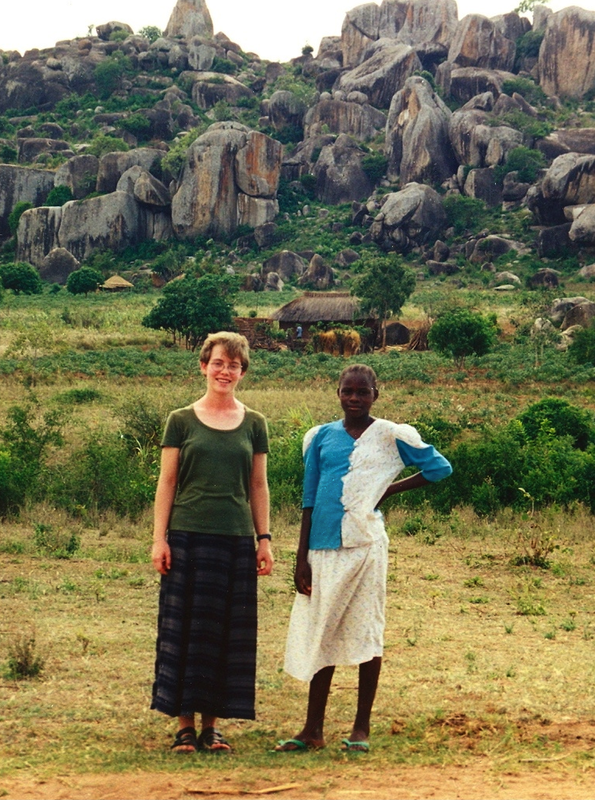 The challenge came several years later when I put aside essays and nonfiction stories about my East-African home and decided to write a middle-grade novel set in Tanzania. Suddenly I had the liberty to combine everything that fascinated me about Tanzania and the local Sukuma tribe in a single piece of writing: witchcraft, traditional medicine, Tanzania’s post-colonial setting, oral storytelling and Tanzania’s unsung heroes, girls. I read every bit of ethnography about the Sukuma I could get my hands on. I reread all of my journals from Tanzania and studied my heavy album of photographs. Now, in addition to catching up with Modesta in our weekly emails and regular phone calls, I asked her endless questions about Sukuma cultural practices, trying to get all my facts straight. I was ready to start writing the novel, but with the liberty of writing fiction came new doubts. Now that I was no longer writing about my personal experience of Tanzania, but instead about a historic village that pre-dated my birth in a culture that was not my own, I questioned if I was the appropriate person to write this story. To be honest, the bigger question in my mind was whether others would judge me for writing about a culture that was not my own. Would it matter to readers that my protagonist and I were born on different continents? In my own estimation, skin color was one of the least important differences between me (I-can-sunburn-in-under-five-minutes, Irish white) and my protagonist (dark, Tanzanian brown), but I wondered if this would be an issue for some readers. Many drafts later, my middle-grade novel, A Girl Called Problem, is in bookstores and in readers’ hands. It was released just a few months before the recent and welcome buzz about multiculturalism and diversity in children’s literature. As a writer, and also as a parent and a reader of children’s literature, I’ve appreciated and been fascinated by so many of the voices in this conversation: Lee and Low’s report on our country’s discouraging track record over the last eighteen years of publishing multicultural literature for kids; First Book’s commitment, announced at the Clinton Global Initiative, to increase the market for diverse children’s literature; and, in particular, Minh Le’s throughtful ponderings about authorship. I also realize I now have some of my own answers to the question of what it takes to write about a culture other than one’s own. We can all agree that being foreign to a culture offers fresh perspective, but the real trick, in my mind, when writing about a different culture is that the writer must have experienced that culture long enough to see complexity. I frequently think of an article about culture shock that I read while living in Tanzania. When adapting to another culture, a series of stages are noted: an initial honeymoon stage, in which the visitor romanticizes the new culture; then several stages of distress, during which she questions why she ever came to this “God-forsaken place;” and, finally, a stage of balance, where she is neither threatened nor romanced by the new culture, where she feels at home, recognizing that this culture, just like the one she came from, is complicated. Complex characters are an important part of any writer’s craft, but they are of particular importance when writing about another culture. For example, in A Girl Called Problem, male insecurities and chauvinism limit the protagonist, Shida, and her village. Nevertheless, Shida’s greatest advocates are two forward-thinking men: her grandfather and one of her teachers. The very regal village nurse, whom Shida worships as a near-divinity, turns out to be younger and less experienced than Shida had imagined. Shida herself has a name that means “Problem” in Swahili, but she proves to be anything but a problem for her village. And the angry old witch, whom Shida fears and discounts, well…you’ll have to read the book to see what happens with her. I didn’t intentionally set out to cast these characters as complex. Instead, they took shape in my mind against the backdrop of a culture that I am lucky enough to know as rich and wonderfully complicated. My time in Tanzania gave me the gift of seeing that complexity, and it was something I wanted to share. Good fiction offers us a window into other lives. 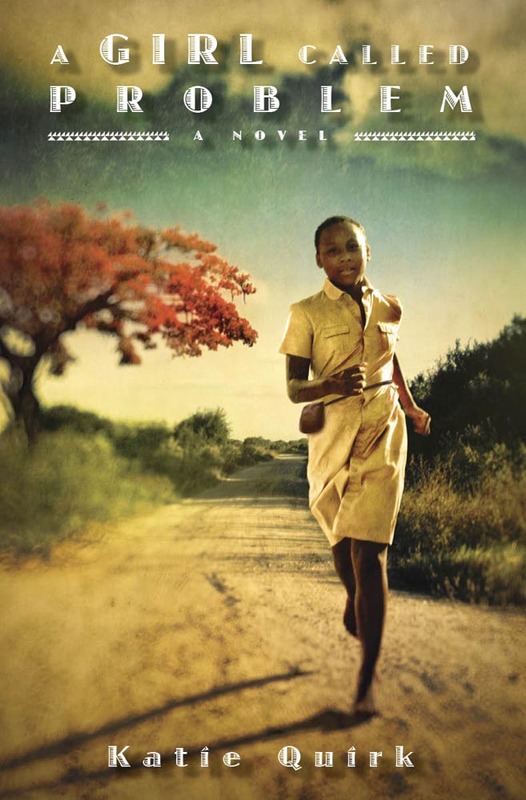 I hope that after reading A Girl Called Problem, young readers will feel as if they have been to Tanzania. When they think of East Africa, they won’t just think of poverty or of lions. Instead they will think of Shida, a girl whose house and evening meal and clothing may look different their own, but whose struggles and interests feel familiar. Katie Quirk (katie-quirk.com), author of A Girl Called Problem, lives in Maine and is currently working on a book about raising her son in India. I loved hearing the story behind your book. I have two former students right now spending their summer in Tanzania, and I will share the book with them, hoping to inspire them to write their own stories. Thank you for telling so much, and making the point about complexity. So often when we travel, the surface is truly only scratched. It’s good to take harder looks at where we are and what we’re thinking. How exciting for your students to spend a summer in Tanzania, Linda, and how nice that they have a teacher as interested and invested as you! It’s exciting to think about all they will learn. If they feel inclined to write to me after they have read the book and completed their travels, I’d love to hear their impressions. All the best! I so loved this book and am thankful it was sent to me at my school!!! Can’t wait to share it with my students. I’m so glad you enjoyed the book, Kerri. Greetings to all in Spokane! I’ll be giving a talk/reading about the book this summer at Aunties Bookstore on August 22nd at 7pm. I’d be delighted to meet you there if you happen to be in town and available. I’m so grateful for learning about this book, and to you for writing about your experiences through this imaginative form. As you said, “Good fiction offers us a window into other lives.’ We need windows like this. So much about what we know of Africa, or other far away places, really, tends to boil down to caricature and old ideas. It is so refreshing to see books such as yours on the shelves – to read, to be inspired by, and to learn from. Thank you! Thanks so much for your thoughtful reply, Tara. It’s wonderful to have teachers like you who are invested in sharing complex stories. Today’s reading list on A Teaching Life looks wonderful. I’ll have to keep checking in there for other good reads. Thanks again! Powerful post. Glad I read it because I will definitely purchase your book. What an undertaking. I liked how you had to step away from your journey there in order to see it clearly. The stages you went to were important to me. My husband’s niece has founded an organization called the Girl’s Education Collaborative in Tanzania. They will be opening the Kitenga School for Girls in January. I’m very interested in learning about your experiences. Thanks so much for alerting me to the Kitenga school, Patricia. It looks like a wonderful project and one that I will definitely follow. I hope you enjoy the book. All the best! Katie, your post could not have come at a better time. I have been bouncing back and forth with the idea of teaching English in South Korea. All of my documents have been submitted with the exception of my completed background check, which has been sitting on my kitchen table for months. Fear of the one-year commitment paralyzed me. I thank you for your passion that flowed from this post. Most importantly, I thank you for inspiring me to plunge into a culture not my own. Go for it, Stephanie! My years abroad have been some of the most challenging, but also some of the best of my life. I had a number of South Korean students when I taught in India and I think living in Korea would be fascinating. Best of luck to you! Congratulations and wishing you all good things with it. It’s wonderful to see your website, Kimberly. and to get acquainted with your books. They are now on my library check out list. I’m also intrigued by your Creative Diary work. You are a productive woman! Thanks for commenting. You are SO sweet, Katie, thanks for looking me up, I feel quite honored. I also have your book in my hands now! Although I’ve promised full manuscript critiques to two people which must come first so I don’t dare open the book yet, although I keep staring at it. 🙂 (btw: are you on Twitter? Just *liked* your FB Fan page.) Good luck with the India memoir! So glad to have met you.